MASTER KAZUMI TABATA 8th Dan. By David Palumbo & John Cheetham. THE 'SNAP' OF KARATE. By Scott Langley. THE PURPOSE OF KATA. By Mike Clarke. LETTERS TO THE EDITOR & SHOTOKAN BOOK REVIEW. TEN PRINCIPLES FOR EFFECTIVE JYU KUMITE. By Glenn Stoddard. THOUGHTS FROM JAPAN: A WORLD OF CHANGES. By Dave Hooper. PASCAL LECOURT 5th Dan. By Andre Brockbernd. TOURNAMENT KARATE AND MIKANSEI By Shawn Wiebe. 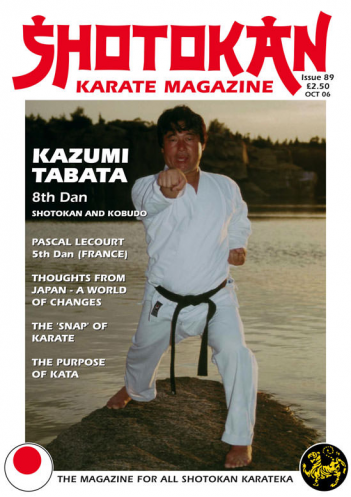 Kazumi Tabata sensei is perhaps not as well known as some of the other senior Japanese instructors both here in Europe or the America's and worldwide. Probably because his lineage is not from the JKA (Japan Karate Association) as he came through the Waseda University group, not Takushoku. However, he has been in the USA since 1967 and teaches all over the country and abroad. His former teacher is a historic figure from the Shotokan family tree. Namely, the late Master Isao Obata a close associate of Gichin Funakoshi. Little is known about Obata sensei and there's hardly any written evidence of his considerable importance in the history of Shotokan karate-do. I purposely asked Tabata sensei about his teacher (Obata) for these very reasons and some interesting, and previously un-known information is passed on to us. Yet another excellent Shotokan sensei who will not be too well known to many readers outside of Europe, is Pascal Lecourt 5th Dan (France) who follows the teachings of his sensei and mentor, the late Master Taiji Kase. Kase sensei's students all seem incredibly loyal and dedicated to preserving Kase's karate, his training, teaching ideas and philosophy. Of course, the same can be said for many other students who follow a particular sensei's way. 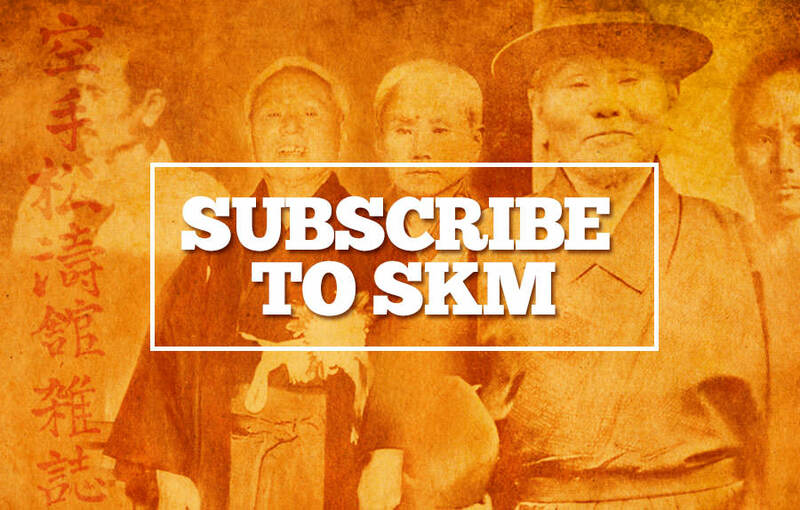 Many readers will be happy to see another article from Dave Hooper who has been a contributor to SKM for many years and quite a controversial character he has been at times! He has been severely critical of some British and European versions of Shotokan in the past (some say extremely unfairly so) and he still likes to have a little dig! Dave is, by his own confession, totally biased in favour of JKA karate. He is equally as dedicated to the JKA karate system as Pascal Lecourt is to Kase's karate. Dave's articles are full of dry humour, sarcasm and irony but when it comes to karate he is deadly serious. Having lived and trained in Japan for thirty years he is an authority on karate in that country. I like Mike Clarke's ideas on kata bunkai/oyo; as he says, the applications of the kata came 'first' (before the actual kata were developed) which is so often overlooked and also that the kata 'combat principles' and 'strategies' are just as (if not more) important, as the actual techniques contained within each kata! This is a thought provoking article, (Mike's usually are) with a different slant on the bunkai/oyo question. It's with great sadness that I have to inform readers of the passing of yet another truly 'Great Master' of Shotokan Karate-Do. The famous Tetsuhiko Asai 9th Dan, who was recently featured in an exclusive interview in SKM 87 (and many previous issues) died on the 15th August 06. This was a complete surprise to many people, but in fact Asai sensei had fought a long battle with leukaemia. We'll be doing a tribute to this great Master in the next edition of SKM. Deep condolences to Asai sensei's wife Keiko and daughter Hoshimi and all his students.